F.A.T - Fried and Tasty is a fried chicken restaurant. We specialise in Southern American style fried chicken with an Australian twist! 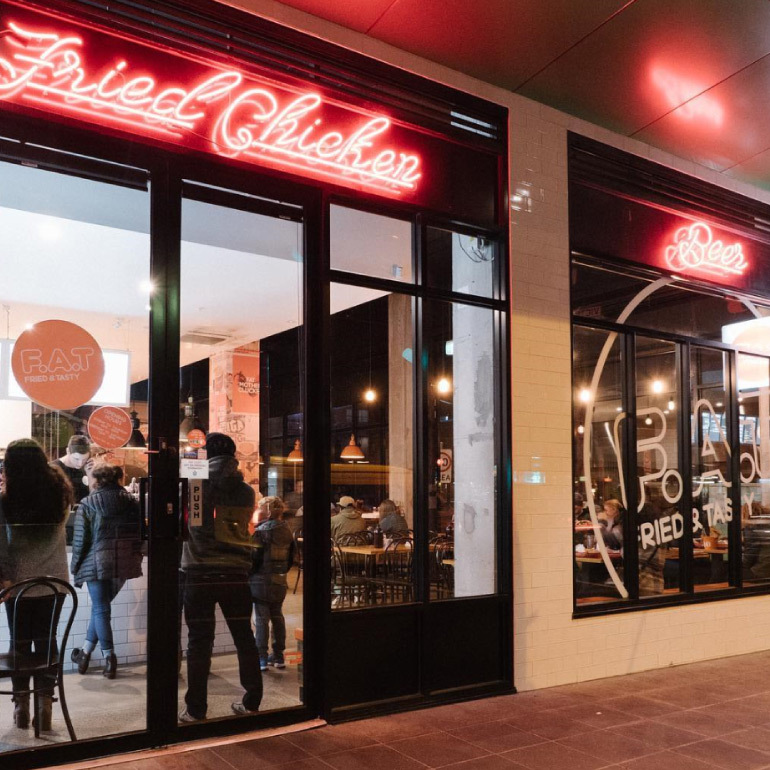 F.A.T - Fried and Tasty was established on July 30th 2015 by Terrence Farrugia, Jonathan, Andrew and Freda Ioannou in Brunswick East, Melbourne. Our fried chicken recipe has been a family affair for many years, with it being passed down the line to son Jonathan and nephew Terrence who have added their own spin on the Southern American recipe. Popular menu items include Chicken & Waffles, Hot Chicken and of course our Original Chicken. F.A.T. - Fried & Tasty is doing fried chicken at it's best. Serving old school Southern Style Fried Chicken, Buttermilk Waffles, Burgers & Beer. Here at F.A.T we have a large dining space that can cater for group bookings of up to 40 patrons and more. For any large bookings or functions, please feel free to email info@friedandtasty.net.au. For this style of booking we offer a set menu which consists of chicken and sides for $25 a head. For all your booking needs please call us in-store on 1300 328 462 or alternatively email us at info@friedandtasty.com or hit us up on Facebook. Unfortunately, we don’t take bookings for less than 6 patrons. @fat_friedandtasty Why do gherkins giggle when you touch them? They're pickle-ish. @fat_friedandtasty @Sassyeats got it right when they dropped in for this #FriedChickenFriday Extravaganza! @fat_friedandtasty Tag the motherclucker who keeps stealing your jokes AND your chicken! Come and visit us at Fried and Tasty, and enjoy some delicious old school southern style fried chicken. We are always looking for skilled and enthusiastic workers. If you think you have what it takes to work at F.A.T, apply today! We wish to create the ultimate F.A.T ‘Fried and Tasty’ experience! We are bold and upfront about what it is that we love, ‘Fried and Tasty’ food and we feel this is our point of difference. Our promise to our customers is to be fresh, produced in store and unprocessed, and to always will be real wholesome food that our mothers used to cook for us ;) We will never compromise the quality of our food. What separates us from the rest is that we will never be processed! Our chicken is all produced chemically free. We use no flavour enhances, MSG or preservatives in any of our food or marinades. We make all of our own sauces and marinades in-house. All food and prep is done in-house. Nothing is brought in ready-made. We wish to create the ultimate FAT 'Fried and Tasty' Experience! We are Bold and upfront about what is it that we love, Fried and Tasty Food and we feel this is our point of difference. Our promise to our customers is to be fresh, produced in store and unprocessed, and to always will be real wholesome food that our mothers used to cook for us ;). We will never compromise the quality of our food. What separates us from the rest is that we will never be processed! We use no flavour enhances, MSG or Preservatives in any of our food or marinades. We make all of our own sauces and marinades in house. All food and Prep is done in-house. Nothing is bought in ready-made. Stay tuned for our next store opening soon!